Our Oregon genealogists are available to research on location. They will find and analyze the best records available to further your family history research. They can search the archives and libraries in Oregon, as well as help you with other special requests. Our researchers are available to visit local archives and libraries to access unique record collections to help with your research. Below is a list of a few of the archives our Oregon researchers have access to. The Oregon State Archives contain several in-depth databases. They have a Historical County Records Guide that holds maps, county and office histories, scenic images. There is also an in-depth guide to records from each of the 36 counties in Oregon. Specific records include Oregon birth records from 1848 to 1912, marriage records from 1848 to 1912, and death records from 1903 to 1962. The Knight Library in the University of Oregon holds 3 million volumes and is the largest research collection in Oregon. It is also home to the most complete collection of Oregon newspapers in the world. Other departments in its Special Collections include its photograph collection, which contains over half a million historic photographs and negatives. The manuscript section of their collection holds the papers of prominent Oregon figures, as well as papers from businesses and organizations from within and beyond the state’s borders. The Mark O. Hatfield Library on Willamette University’s campus contains records about the history of the school. These include records from the Athletics Department, papers from past college presidents, and board of trustees records. Their archives also hold the professional pagers of Robert C. Notson, who was the editor and publisher of The Oregonian from 1925 to 1975. The collection contains scrapbooks of Notson’s life and scrapbooks belonging to his wife Adelia Notson. The Oregon Genealogical Society’s Research Library contains 9,000 books, 3,000 periodicals from all fifty states, and more periodicals from European countries. They specialize in Oregon family history and the pioneers who immigrated to the state. The United Methodist Archives Oregon-Idaho Conference has many genealogical records. Our Oregon genealogists can access the archive on location in Idaho or Oregon. Collections can’t be found online, but researchers may call and set an appointment for genealogical information in the Archive. This is a perfect scenario for our Oregon genealogists to search on location for you. The Oregon Historical Society Library archive contains one of the most extensive collections of state history materials in the U.S. and includes 25,000 maps, 30,000 books, 8.5 million feet of film and videotape, 16,000 rolls of microfilm, 12,000 linear feet of documents, and 2.5 million images from pre-statehood to the present day. The Archdiocese of Portland’s History and Archives Department has Sacramental Records created prior to January 1, 1930, including baptism, communion, confirmation, and marriage records. The Western Conservative Baptist Seminary Library has many genealogical records. The western seminary has access to thousands of journal articles. To inquire about what specific genealogical records are hosted at this library, researchers may inquire online, over the phone, or request an on-sight visit from one of our Oregon genealogists. The Multnomah County Library collections include detailed historical maps of cities and towns in Oregon, Washington, and California. It includes documents such as the Historical Oregonian, daily newspapers from 1861-1987, and from 1987-present. Oregon genealogists can also find America’s obituaries and death notices, 4,000 genealogical databases (located at library) for use to access more than seven million names, and a biography and genealogical master index. Visit the Genealogy Resource Page of the Multnomah County Library for a list of research resources. The Diocese of Baker Archives contain Sacramental records of the Catholic church, and includes records on marriages and deaths, with significant genealogical detail. The State Library of Oregon is home to large archives and special collections. The photograph collection is one of the library’s most prominent collections. This collection contains nearly 20,000 prints, negatives and slides. These photographs cover a large variety of Oregon subjects, many dated from before 1950. The Genealogical Forum of Oregon’s library is one of the largest genealogical collection of materials from the United States in Oregon. Their archives contain over 32,000 items, with about 20% of these articles focusing on the state of Oregon. The rest contain records of other states, as well as European countries, including Ireland, Sweden, France, Italy, and Germany. The George Fox University Library is the oldest Christian university in Oregon. The library contains a Quaker collection. This collection includes 75 years of documents and books that pertain to the history of the religion. The collection also includes writing from the 17th century and a nearly complete file of major Quaker periodicals. The Jackson County Genealogy Library houses the largest collection of genealogical books and resources in southern Oregon. The 16,000 volumes found here cover information from all of the fifty states, but the library specializes in Oregon and Jackson County history. Their records date back to the 1800s and include 1895 poll tax records, articles about residents from early newspapers, and church records from Presbyterian, Catholic, and Methodist branches. 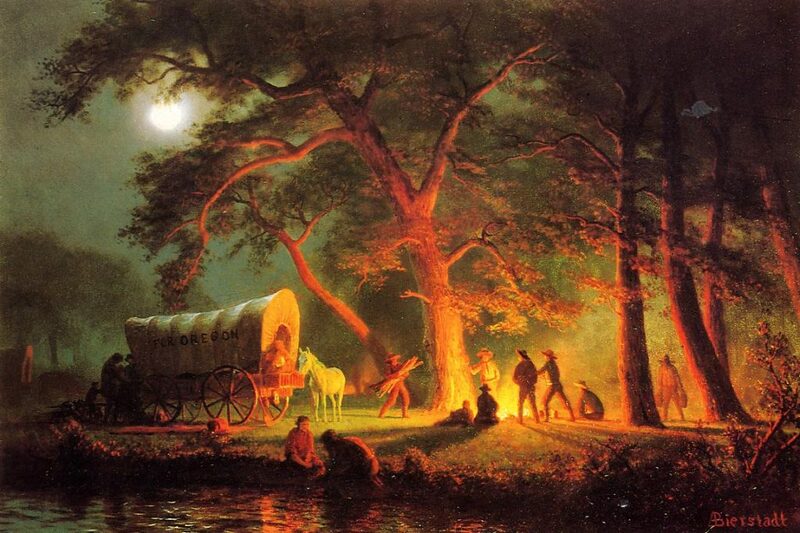 The Oregon Trail is one of the most publically known pioneer routes located in the United States of America. The trail extends from western Missouri, across the Great Plains, through the Rocky Mountains, and into Colorado City. It was the longest overland migration trail in North America–approximately 2,000 miles. Traveling this route normally took around four to six months. All in all, about 80,000 pioneers used it until the transcontinental railroad was established in 1869. There is no complete list of pioneer settlers who traveled the Oregon Trail. Less than one percent have been documented in online databases. However, there are other sources that genealogists can use to find information on the men, women, and children who crossed North America by this route. Oregon’s provisional government was established in the spring of 1843. Many settlers staked out claims of the land. Over 4,000 of these claims were made until Congress declared Oregon a territory in 1848. After that, the system of land ownership changed. Records of these land claims have been published by the Genealogical Forum of Oregon, and contain valuable information to genealogists. Our Oregon genealogists specialize in researching several types of documentation and are not limited to the list above. For more information or specific inquiries about our genealogists, please feel free to contact us.